Pacific Metal Stamping’s specializes in 321 and 347 stainless steel stamped parts including fasteners, washers, bolts, nuts and more. Type 321 stainless steel has five times more titanium than carbon, which stabilizes the alloy to improve weldability. 347 stainless steel is stabilized by an increased amount of niobium and tantalum, resulting in excellent creep-resistant and high stress rupture properties. 321 stainless steel is generally used in applications that require sustainability to high intermittent temperatures. Common applications include aircraft flanges, jet engines parts, heavy duty exhaust systems, chemical handling equipment and firewalls. Similar to 321 stainless steel, 347 stainless steel is used in the aerospace, automotive, and chemical processing industries. Top quality components - When choosing a custom stamping and metal fabrication partner, quality is always a top consideration. We are an ISO 9001 certified metal fabricator, and we use uncompromising quality practices in the manufacturing of all our components. 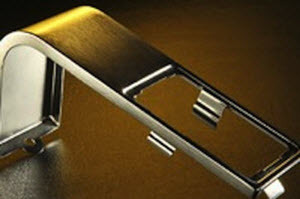 Pacific Metal Stampings is also DFARS and ROHS Compliant. Flexible solutions to accommodate your unique needs - Our short run processes gives us the capability to produce parts in quantities from 250 to 250,000 and with the latest equipment in our fabrication shops, we can produce components in all sizes, shapes, and forms. Cost-saving solutions - Saving you money by providing innovative, cost-effective solutions is our specialty. We save our customers up to 80% off conventional tooling cost.